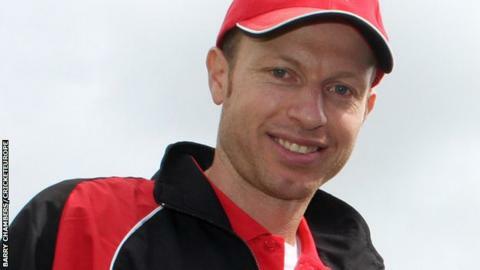 Jersey's new coach Neil MacRae has set his sights on moving the team into the upper echelons of European cricket. The 41-year-old is confident of winning Division Five of the World Cricket League next year as part of his drive to improve standards. "The immediate goal is to become the number one side in Europe outside the main three of Ireland, Holland and Scotland," he told BBC Radio Jersey. "We can try to break into that trio too. There's definitely the potential." Jersey are currently sixth in the ICC European T20 rankings and seventh in the 50-overs format, behind countries such as Italy and Denmark. Macrae, who was appointed as Craig Hogan's successor last week, said the youthful make-up of Jersey's squad was one of the main factors in attracting him to the island. "It's a really exciting time for Jersey cricket - there's a young squad who I've been aware of for the last three years when I've been coaching Austria," he explained. "The youngsters really have a lot of potential to kick on over the next three to five years, so I think at senior level it's a very exciting squad to work with. "And below that on the island there's a great structure in place for the junior players - that pathway is something that can really be developed to feed into the senior team." MacRae was an assistant coach with Scotland before becoming Austria coach three years ago. "It was very much starting from scratch with Austria - it was a very raw squad and a great challenge," he said. "But now I'm really looking forward to coming to Jersey where there's a much more solid structure in place." Jersey will be up against Channel Islands rivals Guernsey, Nigeria, the Cayman Islands, Tanzania and hosts Malaysia in Division Five of the World Cricket League in March and MacRae is aiming for back-to-back promotions following the team's success in Division Six in 2013. "We're going there to win the tournament, there's no two ways about that. We have to prepare properly because we have to go out of season, but we'll go there well-prepared and be confident about winning it," he added. "The organisation is exceptional off the pitch, there's some key people working very hard who are experienced in Jersey cricket, and have a great passion for developing cricket on the island."